Miss Nagoya, Ruriko Kawahara, at the Los Angeles-Nagoya Sister City Affiliation party held at George Lim's restaurant in Chinatown, Los Angeles, California, August 1969. 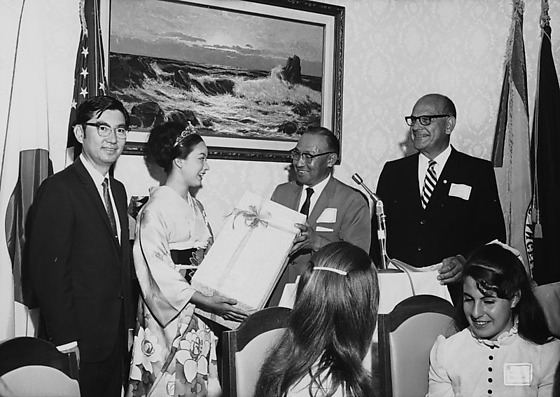 Includes Kawahara, a young Japanese woman dressed in kimono with large floral motif and a tiara; James Nakagawa, Chairman of Sister City Affiliation, a Japanese man in suit and eyeglasses; and George Saiki, Los Angeles Mayor Yorty's assistant, in suit and eyeglasses. People sit with backs to viewer in foreground. Podium with microphone at right and American and Japanese flags at left. Landscape painting on back wall. 1P and 3N: Miss Nagoya and Nakagawa exchange large ribbon-tied box. 2P and 5N: Miss Nagoya and Nakagawa exchange gift wrapped box flanked by two men, Saiki at left, and a Caucacian man at right. 4N: Saiki presents an envelope to Nancy Dassoff, one of four exchange students who returned from trip to Nagoya, Japan. Fellow students Tanda Soker and Frank D. Hobbs or Jay Kouba stand behind her. Dentler Erdmann, a tall Caucasian man, stands at far right, and Nakagawa stands at far left. Miss Nagoya sits in foreground. 6N: Older Japanese man in suit and bow tie and Miss Nagoya stand side by side with tables and three people in background. Typed on original envelope: Nagoya Sister City -- Nagoya Party at Lim's.